Osmonics, of Minnetonka, Minn., has released an interactive WasteWizard Series CD-ROM. This resource provides information about applications of the new products, describes their new mechanics and specifications, teaches users about chemical compatibility of the fluids they would like to recycle, and generates cost-savings estimates. 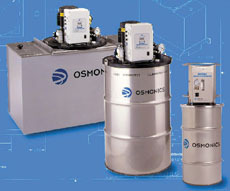 The systems were developed to meet the growing need to purify and recycle spent industrial fluids.